"A Recommendation for Quiet Sitting" (Seiza no susume) was published in 1900 by Kōyūkan, a Buddhist publication house. The work was published while Suzuki was residing in LaSalle, Illinois, and Chicago, working with Paul Carus on The Monist magazine and translations of Buddhist and classical Chinese texts. Although listed as a coeditor of the work with his Zen teacher, Shaku Sōen, the 1908 edition of the work, Hyōshaku seiza no susume, which was annotated by one of Sōen's clerical disciples, Seigo Hōgaku, makes clear that the idea to promote quiet sitting to improve the moral character of Japanese youth was Sōen's, but the text was written by Suzuki. "A Recommendation for Quiet Sitting" is a fine example of Suzuki's early writings on religion and Buddhism in which he strove to harmonize Buddhism and science, a position that can be seen in this essay and in "New Interpretation of Religion" (Shin shūkyō ron, 1896), in which he argued that through science the beauty of religion, including Buddhism, would be revealed. This essay was written against the backdrop of widespread concern in Japan that the character of the nation's youth had declined during the Meiji era (1868-1912) and in the context of the widespread promotion of seiza (quiet sitting) as a means for personal cultivation by a variety of religious denominations. As is clear in the article, for Suzuki the best method of quiet sitting was zazen practice. Through this simple sitting practice, Suzuki argues, the youth of Japan will obtain emotional stability and moral clarity. In the essay, Suzuki bases his argument in favor of zazen practice on the then important theory of emotion, still known as the James-Lange theory of emotion, that was put forth independently by William James in an 1884 essay, "What Is an Emotion," and the following year by the Danish psychologist Carl Lange. According to the James-Lange theory, the physical changes that were commonly believed to be the result of an emotion were rather the emotion itself, or, as James famously wrote in his essay, "we feel sorry because we cry, angry because we strike, afraid because we tremble." By controlling our response to these physiological changes, Suzuki argues, "one obtains composure of mind." Kōyūkan reissued "A Recommendation for Quiet Sitting" eleven times between 1900 and 1939, with slight variations between the editions with regard to ancillary material surrounding the main text, for example, verses, notes, and images. The text also was serialized in a variety of Japanese journals in 1900, under the variant title, "Hinsei shūyōhō to shite zazen kufū o seinen shoshi ni susumu" (Promoting Zazen Practice to Young People as a Method for Cultivating Character). This English translation of the work is based on the version contained in the Suzuki Daisetsu zensho (SDZ 18:391-404). All footnotes in this essay are by the editor (RMJ) of this volume. In recent days the character of our Japanese youth has become noticeably depraved. It is truly at the limit of the lamentable that it has reached the point where not even a trace of the visage of the feudal warriors of old can be recognized in them. Consequently, those of clear intentions aim to create a path to rescue [the youth] based on the power of religion, or the revival of the morality of Confucius and Mencius from former days, or ethical theories that have been tempered by the iron hammer of recent science, or through the distinctive Japanese love of country that has been tempered by and compounded with Western-style nationalism. In truth, there is no doubt that preventing the current decay of the youth and cultivating healthy character are of the greatest urgency. Therefore, we will also express our own opinion a bit and beg for the sage advice of those wiser than us about this matter. We, however, are not going to attempt to compare various theories here, nor will we try to critique various opinions concerning the means for preventing the corruption of the youth, because these opinions mostly appeal to the youthful intellect or promote the regard for social obligation and the working of the discriminative faculty to cultivate the power [to make] discernments concerning law and justice. For this reason, as methods for preventing the overflowing of the passions, they do not teach solid practices (kufū) that [work on] the individual level. If this practice is lacking, no matter the amount of extremely subtle theorizing or minutely detailed study, the benefits for character building will be few. Therefore, we do not take the sort of circuitous path that controls reasoning using reasoning but straightaway describe a familiar, actual method of practice in the hope that young people will trouble themselves a bit to take heed of it. The practice most appropriate for character building we believe is the zazen practice (zazen kufū) of the Zen denomination (Zenshū). For the most part, for the youth of education and discrimination, there is no better method for character building. We do not advance this argument in self-interest; it is rather a plan arrived at after deeply considering the state of learning and intelligence in our nation's youth. We will demonstrate that [this method] has actual benefit. When we mention zazen practice, there are those who will conjure up Zen clerics sequestered in the mountains, working on [koan like] "what is your original face?" However, the "zazen practice" we speak of does not have such a specialized meaning. First of all, take the case of an aspiring young student, one who is boarding in a tiny second-floor room in Hongō district [near Tokyo University]. He may decide to put his room in order, light a stick of incense, and, based on the principles set forth in the Zazengi, sit there quietly (seiza) for a half-hour or an hour. But if he just sits there vacantly, swarms of deluded thoughts and passions (bonnō) arise and he cannot continue quiet sitting for even ten minutes, unless he has a koan-like subject to work on. However, most people, being neither philosophers nor religionists, can avoid the Zen school's koans, which it describes as "biting into raw iron." Instead, according to their personal taste, be it for the Bible's Golden Rule, the splendid words of the Analects, or, again, the principles of utilitarianism [kōrikyō], the expositions of the Stoics, or whatever, they should seize upon a phrase appropriate to building their character and focus all their powers of attention, examining it deeply in every possible way, from side to side and top to bottom. Additionally, the focusing of one's attention on this [phrase] must never be done in the head. This is the foremost matter of vital importance. To those who have a smattering of the theories of recent psychology and physiology, it is [common to say things like] because all mental function arises from within the cranium, when practicing zazen, it is natural to exert the brain-but there is no bigger fallacy than this. Recent theory does not accept the notion that gives disproportionate emphasis to the brain, that is, it does not say that we think with our head, but states [instead] that we think with our whole body. Therefore, you should be aware that when we practice zazen, not only do the cells in the gray matter in the cranium undergo chemical transformations, but the whole body's muscular mechanism, and so on, also all expend some energy. Whatever the academicians may say on this subject aside, when one constantly focuses all one's attention in the brain alone, incurable afflictions of the brain will arise; moreover, even if they do not have consumption, the strong and harmful influence of various nervous afflictions will result in them, naturally creating a variety of illnesses. Therefore, when practicing zazen, put the force of one's whole body in the abdomen, and it is essential that the lungs and heart function fully. Your backbone should be like an iron pillar rising up to the heavens, your abdomen thrust out as immovably as Mount Tai. When all of the mind's functioning takes place in the lower abdomen, we know it is something at the beck and call of our will. In this way, when we place the practice [in our abdomen] stably, inside our chest naturally becomes expansive without even the smallest place of obstruction. Those who are cowardly become bold, those whose minds are filled with stress obtain leisure, those who are impetuous and lacking in patience obtain an interest in freedom from worldly cares, those who cannot overcome immediate desires cultivate the virtues of prudence and affability, and so on. The depth and profundity of this [practice] must be grasped by each individual, then one will understand this explanation. Zen study does not only take zazenpractice as its main activity; therefore its koan are not chosen from such things as the Bible's Golden Rule or the hypotheses of science that easily give rise to associative thought. Rather, they take up problems that seem like riddles. The sound of one hand clapping. What is your original face? They rain down upon the practitioner like blows from a hammer striking his head. This is because superficial mental functions that float around and around on the surface-discrimination, memory, and associative thoughts-with one kick are tripped up, forcing one to penetrate to the great origin of one's self. However, because, for ordinary youth who are practicing zazen in order to cultivate moral character, zazenpractice itself is the immediate purpose, the sort of koan used in Zen study probably would instead cause mental anguish to increase. Therefore, we stated previously that whatever phrase appropriate for the development of one's character one takes up, if one earnestly strives to reach that landmark, it would be sufficient. If we speak from the position of a Zen practitioner, drowning in the realm of diverse moral discriminations is unpleasant; the number one practice is to face the true meaning of the existence of the self, for when one reaches the point where he has no place at all to lay a hand or foot, and he dies and is reborn, then, for the first time, one experiences being back and peacefully settled in one's native place, and one values the new and vital life based on zazen practice that arises from this. But only a person of superior roots in the Great Vehicle, that is, one rich in religious spirit, can reach that point. Not just any person can aspire to this, much as not everyone is able to be a scientist or captain of industry. However, because every person wants to maintain the majestic dignity of building one's character, we promote for everyone the zazenpractice of the Zen specialist and desire for it to become a practical method for the cultivation of moral character. In Christianity there is silent prayer; in Neo-Confucianism there is "quiet sitting" (seiza); in addition, Indian yoga masters practice fasting and purification. For the most part, in every religion there are spiritual practices for training its adherents. However, these training methods have a special meaning and corresponding efficacy for that religion's believers; it is not a practical method for building character for ordinary nonadherents. However, the practice of the Zen specialist sitting full-lotus, placing one's power in the abdomen, and restricting attention to a single place, apart from its religious import, psychologically, biologically has a striking efficacy for benefiting ordinary people. It seems outrageous to state that regulating breathing, putting one's power in the lower abdomen, holding the spinal column erect, and so on, based on this kind of practice, which resembles child's play, will cultivate a person's character. We beg to explain generally in the following [sections] the reason why this is not the case. When one makes an effort to place one's power in one's lower abdomen and gather the whole body's attention, then one's volitional attention greatly is increased. When all of one's mental function arises in the head, the hands are placed on the brow, and the neck is inclined in thought, all of the blood in the body gathers in the upper part of the body, [and] ultimately one cannot prevent a headache from arising. Therefore, doing [things] like making the head clear and thinking continuously one particular thought in this way is by no means something of which the nervous are capable. By contrast, when one assumes the full-lotus posture, holding the spinal column erect, placing one's power in the lower abdomen, the functioning of the lungs and the heart is provided ample room, and when one's breathing is quietly methodical, the blood of the whole body obtains ample oxygen, not only circulating unfettered from the head to the feet, but all the muscles also obtain proper stimulation, and the power of attention can work at its maximum level of strength. In this way, when one time, and then another time, and so on one quickens the spirit to the full, one clearly becomes conscious of a gradual increase in mental power. This is something to which all of the ancient zazen practitioners can attest. However, we have two types of attentiveness, involuntary and voluntary. Involuntary attention is not important as far as the education of the individual is concerned. From elementary school to the university, teachers, in using all their energy to nurture students, actually attempt to increase voluntary attention. It is not a distortion to say that the secret for success of great scientists, great inventors, great captains of industry, and so on is in almost every case due to great power of voluntary attention. When one rejects all external, extraneous stimuli and sensations and focuses the mind at a single point, one understands the words and ample experience of the ancient who declared that "there is nothing under the sun that one cannot understand." At this point, although we will not cite numerous actual examples, we believe this principle is extremely clear. Thus, when the power of voluntary attention gradually increases, the brain is always lucid and imminent [matters of] profit and loss lose their captivating power. It goes without saying that voluntary attention is powerful in the intellectual realm, so it can easily be understood how extremely efficacious it is for the cultivation of moral character. [This is] because increasing the power of voluntary attention amounts to increasing mental function as a whole and increasing mental function as a whole directly becomes the foundation of our character. When, through the method of zazenpractice, one places power in one's lower abdomen, causing the lungs and heart to function fully, the timid become daring, the impetuous become tolerant, those who are chased by momentary desires without thought of past or future are able to cooly withdraw from the swarm of desires, world-abnegating ones who worry about trifling matters and cheerlessly take no pleasure give rise to courage and become cheerful. That this is something that has been personally realized and attested to since ancient times by those who have devoted themselves to zazen there is not the slightest doubt, but for the sake of the today's youths who have become enthralled with the logic of theoretical argument, it will be necessary to expound on the complications at some length. From very ancient times, in the East this method has been familiar; however, it is strange that we have to say that the possession of this technique for cultivating powerful character has been forgotten by Meiji-era people, who in all things speak again and again of the West. When we see the Western scholars that they worship boasting of a new theory that explains the zazen method, the blindness of these Easterners stands out all the more. There are [for example,] Doctor Lange of Copenhagen University and James of Harvard University. According to the explanations of these two doctors, our feelings are not the result of the object directly setting in motion consciousness. The object first gives rise to a transformation in the physical body, then that transformation appears in our consciousness, giving rise to a feeling. To concretely explain this, let us suppose we meet something frightening, namely, in the desolate mountains we meet with a bandit carrying a drawn sword. According to the former way of thinking, first there occurs a frightful thought in consciousness, then afterward the chest heaves, the lower abdomen becomes empty, the base of the tongue will not move, and the muscles of the whole body quiver, as it is said, like a frog's leg to which electricity is applied. The two scholars say, however, this is not so, since an indication of bodily fear first occurs, then afterward the internal consciousness becomes aware of this indication and we think we are frightened. If these changes do not occur in the physical body, the fearful thought will certainly not occur. As proof of this, see what happens when one eliminates the empty feeling in the lower abdomen, immobility of the base of the tongue, trembling with fear of the whole body, constriction of the breathing, wild fluctuations of the pulse: the so-called thought of fear is nothing more than an empty feeling, that is, it completely becomes a meaningless thing. Those who are opposed to the theory exaggerate and mockingly state, "we do not cry because we are sad, nor are amused because of something funny, but because we cry we are sad, because the muscles in our face convulse, we are amused." The doctors, however, in earnest state that "those opposed certainly do not exaggerate, for look, when one suppresses tears, one is not internally sad. When one releases the dam one time, one cannot bear the sadness [with its] sobbing and weeping. The same is true of laughing. The same is true of anger." If we look from our perspective, the doctors' theory has some interesting points. According to the zazenmethod at hand, one strives to always keep the lower abdomen full of power, the breathing always uniform, the heart beat tranquil, the muscles of the whole body always resilient, so if, for example, a scary person should appear before one, because one's chest would not palpitate or face lose its color, our mind would not be a bit different than usual, and one necessarily would remain calm and collected as if no one was there. According to the Lange-James hypothesis, this is because emotion is nothing more than consciousness of changes in the physical body arising from an object. When changes in the physical body, that is, the chest palpitating, emptiness in the abdomen, and the like, that are indications of fear quickly dissipate due to the practice of zazen, what sort of abnormal impulses can arise in consciousness? From ancient times in China and Japan, the ability of masters of zazen to never lose the feeling of freedom from worldly cares, and to remain composed whether encountering good or bad circumstances or dwelling within the realm of the six desires is, in addition to being due to the power (toku) of religious peace of mind, also the power given [to them] through the practice of this full-lotus sitting, we must not forget. The hypothesis of the two Western doctors is not based on the results of the Eastern zazenmethod, but they only infer it from the observation of everyday facts, [while] zazenmasters, without knowing the theory, transmit the way personally to experience [it]. What is more, the conclusion of the two sides is the same, for it is not strange, is it, to say that the truth does not change no matter where one goes? Here we have explained this using as an example the thought of something fearful, but the same principle can be applied to other feelings as well. For example, there is the feeling of bashfulness. Although this feeling of bashfulness is prevalent among women, it is not rare among men as well. When appearing before others, one is different than when one is by oneself and, somehow, one loses one's ordinary composure, as one's breathing becomes somewhat quickened, the pulse irregular, with its rhythm changing somewhat. In particular, when meeting one's superiors or total strangers, these feelings are extremely pronounced. Considering this in light of the aforementioned principle, the ability of zazenpractice to also eliminate the feeling of constriction to the free activity of the mind in this manner becomes clear. Master Hakuin's ability, after sitting zazen all night, to at once awaken to the import of his great fear, becoming undaunted by kings, princes, or nobles, was [due to] a condition of the mind and body suddenly flashing across his consciousness that was able to control fully the physical body's symptoms arising from feelings of bashfulness and intimidation and so on. Because, in the zazen practice of the Zen specialist, one does not work from the perspective only of the physical body, but rather trains the mind along with it, the practical manifestation of its efficacy is extremely remarkable. As much as possible we should promote it to everyone, using religious principles for those who adhere to [Zen] and the method of zazen practice for those who are external [to it], but, although nothing is superior to training body and mind together, because, as stated above, within people's spiritual capacity and circumstances there are a multitude of distinctions, for the time being we will be content just with promoting the outward form of the practice. There is a person in the West known as Pascal, who said that in serving others do not speak about religious theories and the like, for in any case, just by being thankful for, believing in, and saying amen to the various ceremonies conducted daily, the truth of religion will naturally manifest in your companion's heart, did he not? This is extremely interesting. The hypothesis, noted above, of the two doctors, the hypothesis about building up the lower abdomen through the practice of zazen, and Pascal's hypothesis: are not all of these just looking at the same coin from both sides? In this manner, a particular sort of mental state corresponds to a particular sort of state of the physical body, therefore if the state of the physical body is completely content, that mental state will come to naturally correspond. Therefore, we can say that when an actor steps onto the stage and mimics the actions of a loyal subject, based on the degree to which he is able to mimic, he, at that moment, to that extent, becomes a loyal subject. If one has completely trained the body and mind through the practice of zazen, one has reserves when confronted with circumstances. Wealth, honor, and prosperity are like floating clouds and adversity resembles dreams and phantasms. One's authority and power cannot be bowed and flattery cannot stain one, for one is completely a true, imposing great man. Mencius also spoke of cultivating flood-like vital energy; in the end this means nothing more than that, through the benefit of the practice of zazen, the fundamental energy for our activity is not expended outside [of oneself] [but] is kept deeply inside. At the end of section 1, when we explained voluntary attention, this was already a point that the reader probably had grasped. In other words, accumulating the fundamental power of our activity internally, according to psychology, is called restraining reflex action. If we look at this positively, this is increasing the voluntary power of attention. Mental reflex action is said to be when the mind moves unconsciously directly in response to external stimuli. So-called transitory feelings are all included within this [class of] reflex actions. When one sees all sorts of sumptuous delicacies, one experiences the secretion of saliva; when one meets a woman so beautiful that flowers close in shyness and the moon hides itself, the feeling of yearning [for her] is unbearable; when one sees a person of wealth, honor, and prosperity, it is hard to suppress feelings of envy; like floating clouds, when one gains honor, abruptly one feels as if one was walking on air; tasting the bitterness [of life], one cannot keep from losing heart; and so on. Since we reside in the world of impermanence and constant change, mental vitality is wasted in [the face of] the alternation of joy and sorrow and gain and loss. These all can be seen as keen indications of reflex action. In plants there is only reflex action. When one reaches the lower animals, there is some consciousness, and for dogs, cats, and the like they probably have some sort of thought that is separate from immediate stimuli and present sensations. Infants are also like this; they just cry when hungry and smile when embraced. Through youth until reaching adulthood, reflex action increasingly diminishes, as one tries to approach all things after first engaging in reflection and deliberation. Therefore, we can say that as one draws closer to perfecting one's character, [the more] one's mental activity becomes centered and accumulates [power]. With regard to this point, physical laws and psychology agree, that is, the more energy is accumulated, the power to accomplish even a great deal of work grows. For this reason, if one wants to obtain composure of mind, as much as possible restrain reflex action in response to momentary stimuli, and one must at all times build up mental energy internally. Furthermore, the primary condition for restraining reflex action is providing the mental faculty with extra time [for deliberation]. When one has extra time [for deliberation], because one obtains the margin for reflection and deliberation, one does not move due to transitory feelings. The majority of people allow themselves to be overcome by momentary anger, then instantly after striking their companion become greatly remorseful-does that not happen frequently? Or, one's imagination takes flight upon hearing a sudden sound, one reaches an extreme of panic, [to the point of] utter helplessness, then, noticing that the sound was a rat jumping down from a shelf, one naturally is embarrassed by one's own inordinate panic-does that not happen frequently? If these people had a margin of time [to reflect], they certainly would not have wasted mental energy in reflex actions such as these. In this being so, when we ask how one can obtain this margin of time [to reflect], there is nothing like zazenpractice. When one engages in zazen practice for a long time, naturally there is power in one's lower abdomen, and, like the swaggering stride of an imposing, experienced warrior, the activity of one's lungs and heart is not easily disturbed. In addition, because the whole body is filled with power and vital force like water extending without any lack throughout the great oceans, even if an external stimulus should suddenly appear, one remains unmovable as a rock, able to gather all of these [stimuli] in the recesses of one's heart and leave them [as if they were no more than] numerous waves on the great ocean. This is because no matter how much these external stimuli and present feelings push one to respond reflexively, because the whole body is filled with the power of the vital force one can easily summon the strength within to prevent [these external urges] from penetrating to the recesses of one's heart. It is as if "one does not become the servant of things," or as if "one makes the utmost of all twenty-four hours of the day." Of course, although this is no different than religious training, we also must not forget that more than anything else, zazen practice helps in this regard. If one continues to engage in zazen practice for a long period of time, even if one is not able to penetrate to the "true original face" of religion, one is nonetheless sure to reach the point where he finds he is attaining greater peace of mind. As the proverb states, "although one isn't completely on the mark, still it is not far away." Then, if you are fortunate, you may experience a sudden flash of religious insight announcing that you have at this point reached the stage of primary importance [in which one comprehends] the cause for the appearance of Buddhas in the world, that is, achieving awakening and saving all sentient beings from suffering. If one completely penetrates into this realm, one is able to realize the limitless meaning in a blade of withered wild field grass and one can affirm the inexpressible beauty of the amoeba tumbling about in the sludge. Even the affairs of we humans-the confused, complicated, passion-ridden, and deluded entangling worldly concerns-are all illuminated by the original light [of the Buddhas] and one can make clearly manifest the spiritual realm that is beyond expression. Religionists call this "being provided with the eye that penetrates to the highest point," or also "being embraced and received by Amitābha's compassion, or "receiving the grace of God." Although they are based on differences in the premises and although there are expressions that differ between positive and negative and self-power versus other-power, those whose eyes one time have seen this subjective mystery clearly for themselves can know firsthand this different realm that is removed from the tangled web of words and thought. From the perspective of discriminative knowledge, Plato's world of ideals and Kant's world of true substance have no meaning. However, once one has experienced Buddhist awakening and has seen its subjective and mysterious light, the world, which seemed like a dream, immediately becomes the real and actual world, the world of one's own five senses and desires. Those with eyes must look; those with ears must listen! At this point, we should conclude our general proclamation of the efficacy of zazenpractice. Superficially, it might seem to be insignificant, a mere trifle, but when one reflects upon it a bit further and sees its psychological, biological, and religious foundations, it possesses an actuality beyond what one expected. I believe this is something of which today's youth are unaware. In any case, we hope that these individuals will take up this perfectly fitting method of practice and try sitting zazen, mustering all the power they can command in an effort to overcome their deluded thoughts. In the beginning they probably cannot do zazen satisfactorily for even five minutes. However, if one lacks the intent to triumph over this, how can one build one's character? Here we do not inquire about what doctrines or ideals these individuals embrace; we only recommend that they for a time attempt to apply, beginning with the external form, this concrete practice. Daisetsu Teitaro Suzuki was a key figure in the introduction of Buddhism to the non-Asian world. Many outside of Japan encountered Buddhism for the first time through his writings and teaching, and for nearly a century his work and legacy have contributed to the ongoing religious and cultural interchange between Japan and the rest of the world, particularly the United States and Europe. 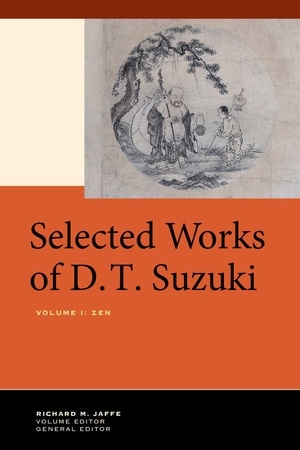 Selected Works of D. T. Suzuki gathers the full range of Suzuki’s writings—both classic essays and lesser-known but equally significant articles. 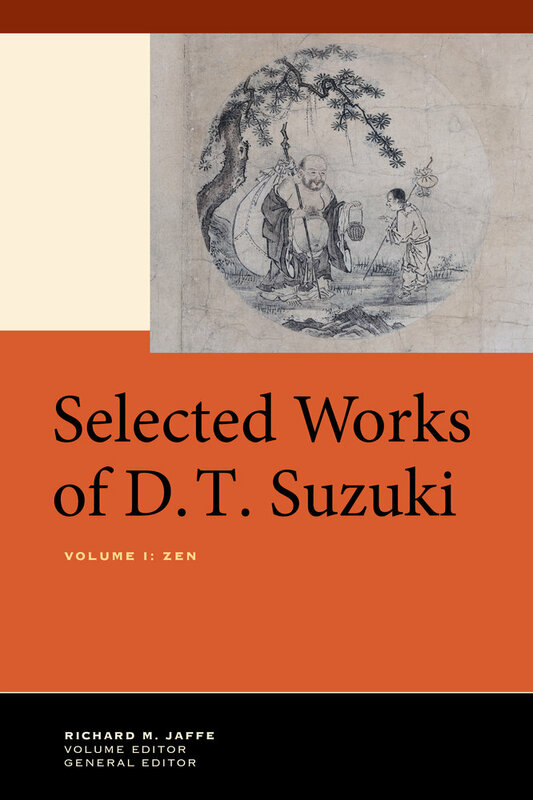 This first volume in the series presents a collection of Suzuki’s writings on Zen Buddhist thought and practice. In an effort to ensure the continued relevance of Zen, Suzuki drew on his years of study and practice, placing the tradition into conversation with key trends in nineteenth- and twentieth-century thought. Richard M. Jaffe’s in-depth introduction situates Suzuki’s approach to Zen in the context of modern developments in religious thought, practice, and scholarship. The romanization of Buddhist names and technical terms has been updated, and Chinese and Japanese characters, which were removed from many post–World War II editions of Suzuki’s work, have been reinstated. This will be a valuable edition of Suzuki’s writings for contemporary scholars and students of Buddhism. Daisetsu Teitaro Suzuki (1870–1966) was a Japanese-born scholar and translator who over the course of the twentieth century came to be regarded as one of the leading authorities on Zen Buddhism. He was the author of more than a hundred works on the subject in both Japanese and English and was instrumental in bringing the teachings of Zen and other forms of Buddhism to the attention of the Western world. His many books in English include An Introduction to Zen Buddhism, Essays in Zen Buddhism, Living by Zen, Zen and Japanese Culture, Mysticism: Christian and Buddhist, and Shin Buddhism. Richard M. Jaffe is Associate Professor of Religious Studies at Duke University and the author of Neither Monk nor Layman: Clerical Marriage in Modern Japanese Buddhism.